NOTE: Currently this integration is for Jira Cloud. For Jira On-Prem users, we encourage the use of our Report a Bug feature instead. 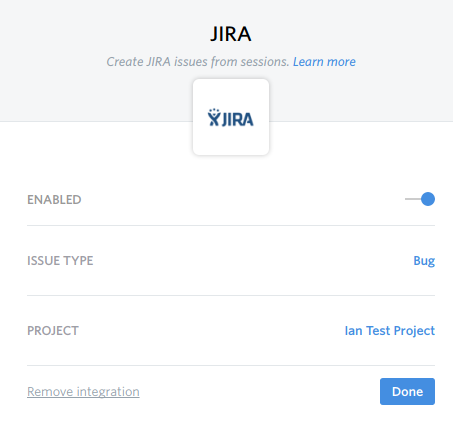 FullStory's integration with Jira makes it easy to create a new Jira ticket when you notice a bug or issue in a customer's session in FullStory. We'll automatically send all the details we have about the customer's session (including a link to the playback and the customer's URL, IP address, UserAgent, and Viewport details), making it faster and easier to understand and reproduce the customer's experience and start solving the problem. 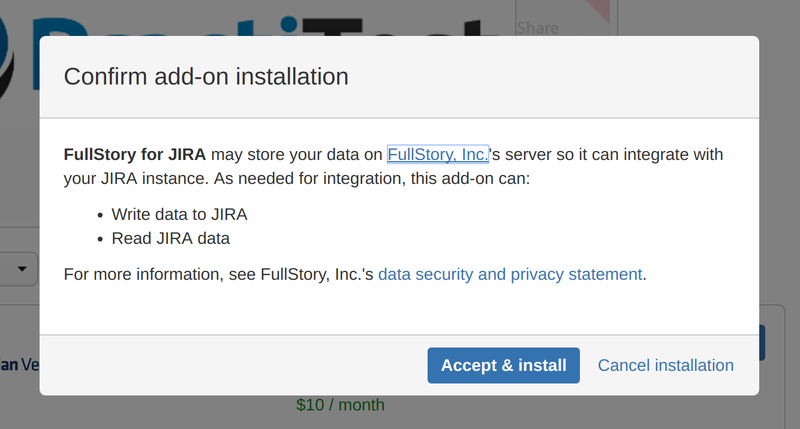 Log in to the FullStory account for which you want to install JIRA. From the Jira homepage, go to Settings > Add-ons > Find new add-ons. In the Atlassian Marketplace for Jira page, search for FullStory and click Install on the FullStory integration. 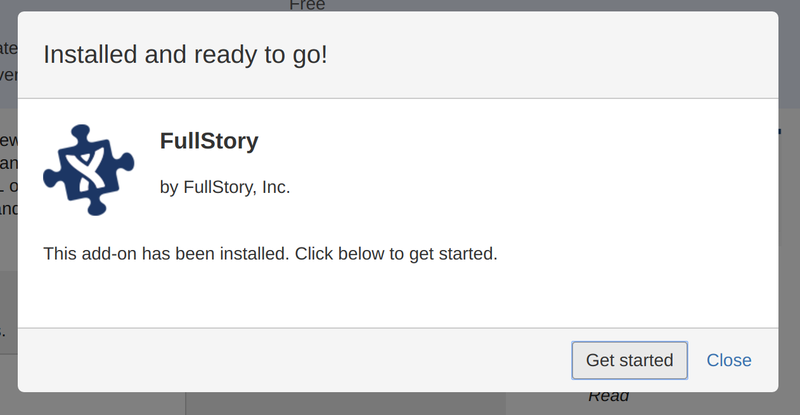 Click Accept & install to add the FullStory for Jira add-on to your Jira instance. Once the add-on is installed, click Get Started to set up the configuration. Set the Project and Issue Type. When you share a FullStory note to Jira it will be for the project and as the issue type you indicate here. (You can change these defaults later in FullStory settings). Then click Save Configuration. NOTE: If you're missing some Projects in the dropdown, scroll to the end of this article to see how to troubleshoot. Now that you've enabled and set up the add-on, when you make a note on a FullStory session, you'll see the option to share that note to Jira. When you click SEND TO: Jira, you'll see a new window where you can customize the content used to create the ticket. We'll automatically use your note text as the summary and we'll add all the session details to the description section of the ticket. You'll also need to set any required fields as you're creating the Jira ticket. Click Send and the ticket will be created in Jira. Look for the success notification in the bottom right hand corner. You can click on the note link in this pop-up notification to view the newly created ticket in Jira. 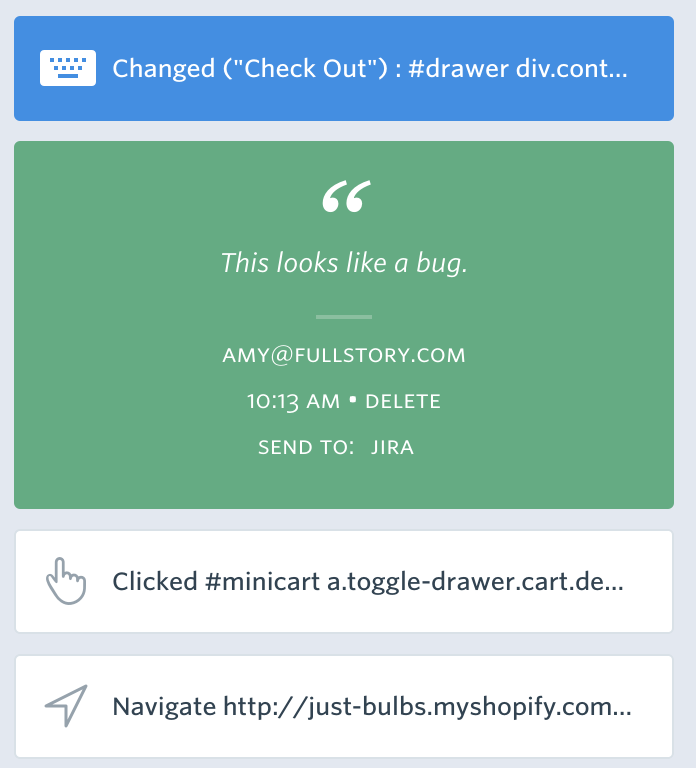 You can find this link again by clicking on the 'Jira' link in your FullStory playback note again. By default, all of your Jira notes will be sent to the Project you indicate and be set as the Issue Type you indicate during setup. You can change the default settings any time you need from FullStory settings. 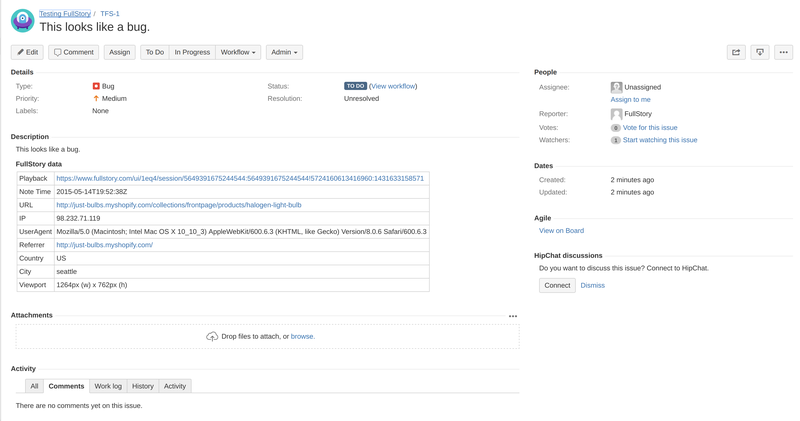 Next to Jira, click View. Use the pop-out menu to disable the integration or change the issue or project type. Often, this is a permissions issue. 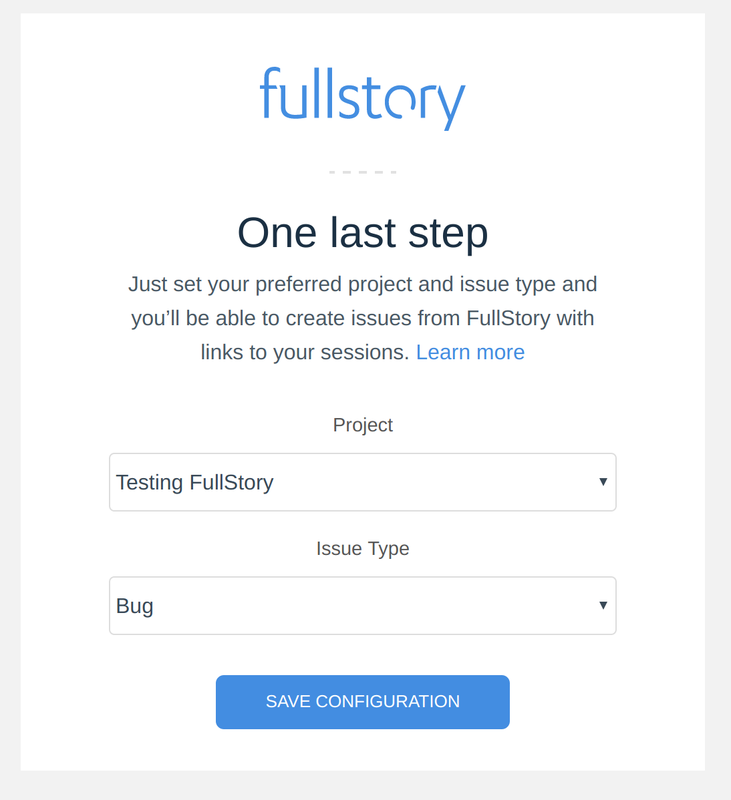 The FullStory add-on must have "create issues" permissions on any project that you want to use. Typically, this permission is granted by default when you first install the add-on, but depending on your Jira configuration this may not be the case. To view or edit project-level permissions, go to [cog in the upper right] → Projects tab → [click on a project] → Permissions and then scroll down to "create issues".